In the Upanishads of ancient India, the jewel of consciousness is seen to manifest itself in “all that shines: the sun, moon, fire, and speech.” The brightest lights in the sky are earth’s key luminaries. What we should be doing here, the waxing and waning energy of life itself can be seen in the Sun and Moon and their interactions with each other. Human aspiration is always linked to them, as well as to fire and speech. The nature of Dharma is also that of fire. It governs the Ascendant – the beginning of life. Dharma is always present, but becomes more powerful as we understand how our true nature shows a purpose for being here and receiving this light in its various forms. Planet Jupiter is associated with Dharma because its purpose is to remove the darkness and bring the light of truth and knowledge. It knows how to teach, being the divine teacher, the guru. The word guru in Sanskrit literally means “the remover of darkness.” Jupiter brings the grace of God, and the only real luck in life. It rules over abundance as well as spiritual matters and religious ideology. Though it brings truth, tolerance and forgiveness, if it is weak or afflicted it may symbolize a truth-seeker who is an ideologue, a religious fanatic, or any person who bends the truth to suit his or her needs. When Jupiter is weak or afflicted, both the individual and the collective Dharma are temporarily affected. The astrological birth chart gives a snapshot of when consciousness enters matter. This moment is defined as when prana (the breath) enters the body. Being the primal life force, prana is vital for life, and even has a unit of time assigned to it. At the moment prana enters the body, not only is the individual Dharma defined, but the Law of Karma begins to operate. Without physical manifestation, it cannot operate. So the birth moment, as described in the heavens, is the key to the dharmic and karmic destiny. Saturn is Kala, the time clock, ruling over time, death, and reality. If Jupiter elevates us to pursue higher knowledge, and keeps us gazing towards the heavens, Saturn keeps our focus on the requirements of our karmic destiny, namely reaping the consequences of our actions, or thoughts or words. Saturn also rules over the Truth, especially in terms of physical reality. Saturn’s many rings remind us that we have many duties and obligations while we are in physical form. Also, we have a time limit. Saturn always reminds us of our mortality and of the finiteness of Time itself. If Jupiter is limitless, Saturn shows us our limitations and limits throughout life. In this way Jupiter’s transits may expand the situation, and Saturn’s transits may appear to contract them. But without Saturn – the matter has less definition, and less light shed on it, in terms of material reality. When both Jupiter and Saturn aspect a certain house, or field of action, there is finally a chance to move forward in a more concrete way. Most predictions should be based on these two planets in the chart. Whatever zodiacal signs Jupiter and Saturn are transiting, both hands of the clock are always there, and always moving together. The big hand of the clock is Saturn, and the little hand is Jupiter, since it is moving faster. Astrologers focus on the conjunctions of Jupiter and Saturn, their oppositions, their trines and sextiles, and mutual contacts, natally and by transit. As with the soli-lunar cycle, the conjunctions and oppositions are the most important. But we should always be aware of Jupiter and Saturn’s mutual positions: where is the one in relation to the other, by house, sign, and nakshatra. Their current positions in the skies will tell us about the current key Dharmic and Karmic focus. In any given chart, we assess them primarily from the Ascendant – the beginning of the Dharmic destiny – and secondarily from natal Moon and Navamsa Ascendant. In general, Dharma describes the harmony of the universe. On a personal level, it is one’s true nature, one’s rightful purpose in life, and the duties and responsibilities therein. The Dharma of everybody is the same, in the sense of following one’s true nature. It is also righteous living and right action. You don’t have to do something special, though to carry out your Dharma may require spiritual fortitude and regular practice. If one is expressing one’s dharma, it is easier to deal with karma – our conscious actions on an ongoing basis, as well as the cumulative effects of our actions in this life as well as in previous lives. Vedic astrology enables us to identify the dharmic and karmic destiny of the individual, or group or nation. Specific time periods indicate when negative or positive karmas will come due. 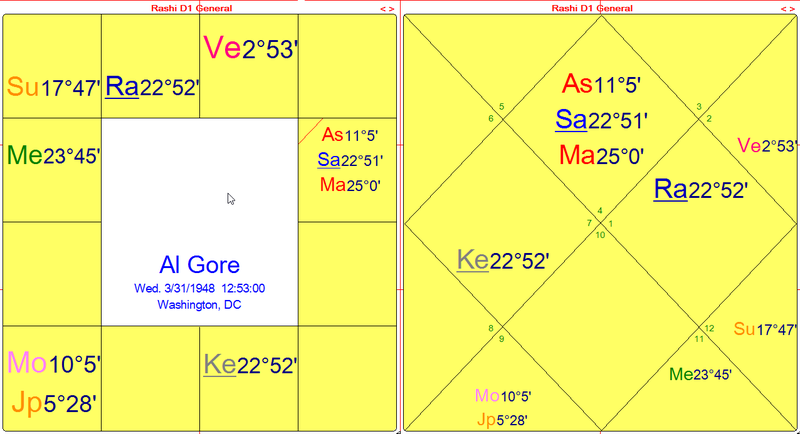 Where they are positioned from the birth chart Ascendant, by house, by sign, by nakshatra. Secondarily, we observe natal and transiting Jupiter and Saturn from Navamsa Ascendant and from natal Moon. Whether they are aspecting or contacting the Ascendant &/or Asc. lord.Mutual contacts between these points facilitate clarity of life purpose. Where the sign lord and nakshatra lord (Jiva, or life force planet) of both Dharma and Karma lord are placed. What aspects they receive from other planets, aspects from classic malefic planets being more problematic, especially Rahu and Ketu. Very important: Where natal Jupiter and Saturn are placed in the chart in relation to each other. Greatest amount of strength in kendras and trines. Opposition: aspect of crisis. Note which houses, signs they are in. Trine: a more stable aspect, as Jupiter (only) can aspect Saturn. Sextile: moderately stabilizing, especially if in good houses, with strength by house, sign, or nakshatra position, and especially if Saturn aspects Jupiter, at the same time strengthening Jupiter. Exchange of sign or nakshatra lords, Parivartana yoga or Nadi yoga, respectively. 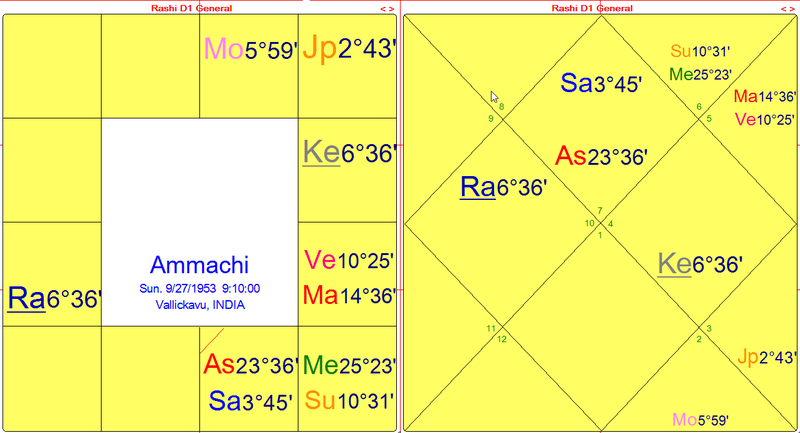 This can give enormous power to the mutual connection of Jupiter and Saturn as Dharma & Karma lords in the chart, especially if the exchange is between Kendra & trinal houses. Mutual kendras: Can be especially powerful if one of the planets is in a Kendra or trine from the Ascendant. Their joint effectiveness depends on placement of sign and nakshatra. Note if Saturn is in a one-way aspect to Jupiter, and whether Jupiter is thereby enhanced or weakened. This depends on Saturn’s strength by house, sign, and nakshatra position, and how well it is aspected. Mutual 6-8 house relationship, i.e. no mutual aspect: a conflict between the Dharma and the Karma, even if out of mutual aspect by a small orb. Inner & outer battle to achieve the Dharmic destiny, with an obsession to overcome early defeats and/or expectations. The sign and nakshatra on the Ascendant will tell the Dharmic thrust of the life, and the Moon will show how we are likely to deal with that Dharmic and Karmic destiny. The ascendant (the juncture of the eastern horizon and the ecliptic) is where the life of the individual or of anything begins. Astronomically, the Ascendant is also the fastest moving point in the astrological chart. In Vedic philosophy, it is here that the cosmic principle enters the incarnation, and at this specific point in material reality the consciousness becomes embodied. The individual dharmic and karmic destiny is thus inextricable from this moment of birth. Dharma cannot be fulfilled without the help of a strong Ascendant lord and a strong lord of Karma – 10th lord or Saturn. Houses 1, 5,and 9 are already Dharma houses, and the 10th house (though also expressing Artha – or material security) is the house of Karma, being the most visible house. The Ascendant and Ascendant lord, especially initially the Ascendant sign, shows the primary underlying motivation for the life. It is crucial to understand it, to accept it, and work with it. It is also crucial to understand that who we are physically, mentally, emotionally is already a preliminary expression of our Dharma. The interaction of Jupiter and Saturn with the Ascendant lord and/or the Ascendant gives us a better understanding of whether there is more opportunity to carry out the Dharma, and thus have a more dynamic Karmic destiny. 1) Barack Obama, lawyer, U.S. Senator & Presidential candidate. (b. Aug. 4, 1961, 7:24 PM HST, Honolulu, HI)  Ascendant is 24:44 Capricorn, with JU-SA in Capricorn in the 1st house in Uttara Ashada nakshatra, owned by the Sun, also placed in a Kendra. Jupiter and Saturn in a kendra indicate strong leadership skills, and the Sun-Saturn opposition in Kendra houses shows a destiny to challenge the status quo in political life. Confirming this destiny is Obama’s announcement of his presidential candidacy on Feb. 10, 2007, 10:10 AM CST, Springfield, Illinois. Aries rises, with Sun-Saturn in exact opposition across the 10th – 4th houses, Sun at 27:34 Capricorn, Saturn retrograde at 27:41 Cancer. Tr. 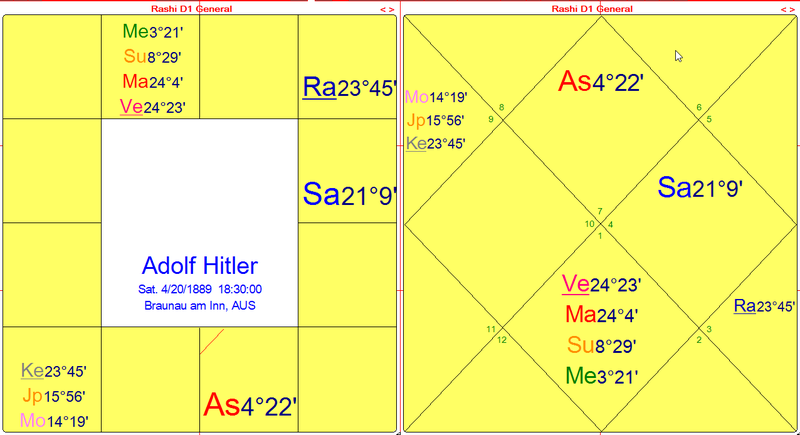 Jupiter was at 21:32 Scorpio, in a close trine to Saturn, both in Mercury-owned nakshatras. The trine of tr. Jupiter and Saturn by water from Jan. – June 2007, and by fire Jan. – early Dec. 2008 should help to stabilize otherwise unwieldy social and political forces, including the exact opposition of tr. Saturn and tr. Uranus on Election day Nov. 4, 2008, echoing a major challenge to the status quo. 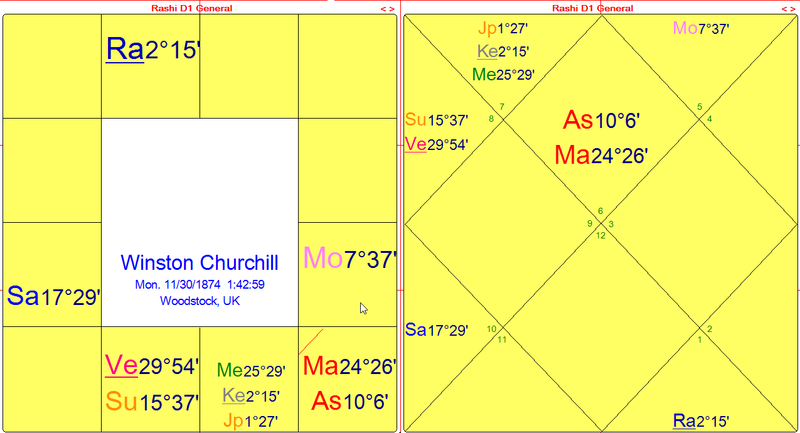 Saturn’s transit to Obama’s 8th house cusp is not typically auspicious, but exceptions to the difficult Ashtama shani can occur, as with Winston Churchill when he was appointed British Prime Minister May 10, 1940. Offsetting this is Obama’s favorable Jupiter-Moon dasa through March 25, 2009. This combination smooths the way for him to get elected. On Inauguration day, tr. Jupiter (and Dasa lord) returns close to its natal position in Capricorn. The next two dasa-bhuktis are less auspicious, reading from Ascendant and Dasa lord, though from natal Moon, they are more so. His 16-year Jupiter dasa began July 24, 1996. 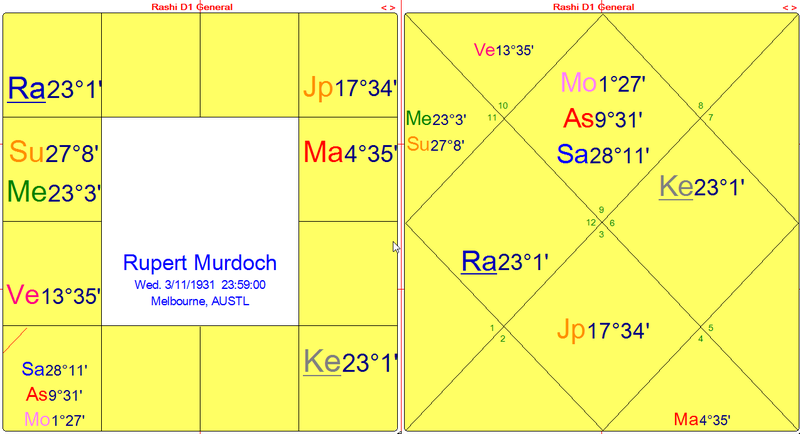 Natal Moon is exalted in the 5th house at 10:02 Taurus in Rohini nakshatra. 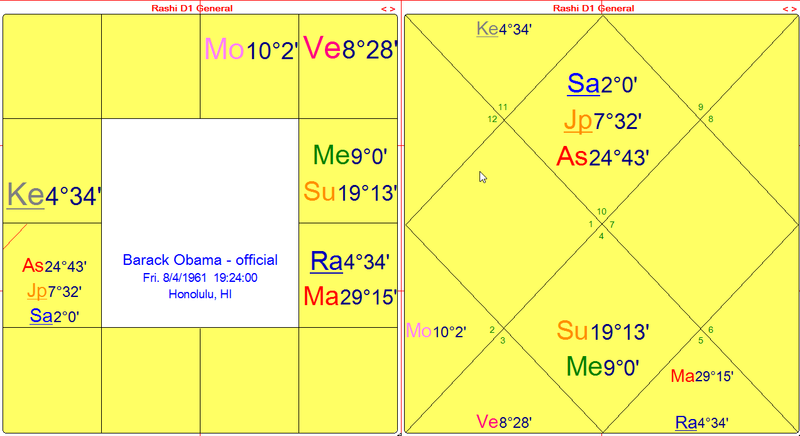 In general, Obama’s birth chart is more favorable from Chandra Lagna than from the Capricorn Ascendant. 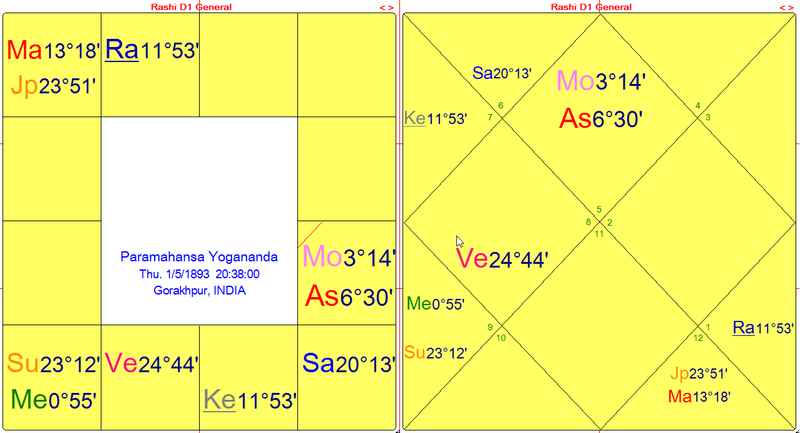 From Moon, Jupiter and Saturn are 9th and 11th house lords, and form a powerful Dhana yoga. By fall 2007, Obama had broken all records of campaign funds raised over the Internet by a Presidential candidate, also receiving public support from Oprah Winfrey and later Caroline Kennedy. Large and enthusiastic crowds flock to the campaign events of this “Candidate -Rock Star.” A Harvard Law School graduate, he is an African-American of multi-racial parentage, African (Kenya) and Anglo (Kansas, USA). All the JU-SA conjunctions from his birth in 1961 would have occurred in either Kendra or trinal houses, bestowing the most power and good fortune. 2) Michael J. Fox, popular television and film actor in the USA, diagnosed with Parkinson’s disease in 1991. (b. June 9, 1961, 0:15 MST, Edmonton, Canada.) Ascendant 25:17 Capricorn, JU-SA in the Ascendant. JU-SA oppositions at 10:09 Cancer/ Capricorn, and 13:07 Cancer /Capricorn March 16, 1991 and May 17, 1991 respectively, were very hard on his health. (These were the last of five JU-SA oppositions, starting Sept. 10,1989. The first three oppositions were in Gemini/ Sagittarius, across Houses 6 and 12 in his birth chart.) The cumulative effect was a complete change in his life over the next few years, and an enforced retirement from his film career, though he became active as a public spokesperson and fundraiser for Parkinson’s research and an advocate for stem cell research. His 10-year Moon dasa started March 2, 1990. 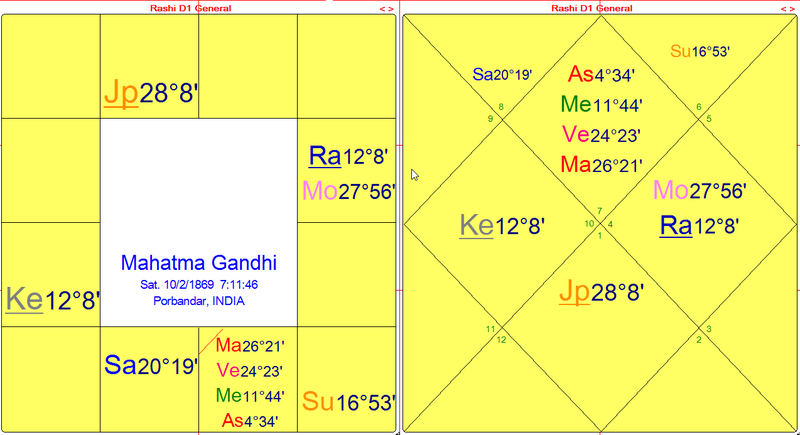 Moon is at 8:08 Aries with Venus in the 4th house, and forms a Parivartana yoga with debilitated Mars. Mars, in turn, casts an exact aspect to the Ascendant, and debilitated Jupiter (12th house lord) is in the Ascendant with Saturn. Amplified by the leadership orientation of JU-SA in the Ascendant, Fox shares with Obama much of the same sense of Capricorn social responsibility. 3) Walt Disney, cartoonist, filmmaker. (b. Dec. 5, 1901, 0:35 CST, Chicago, IL.) Ascendant 3:09 Virgo, JU-SA in Sagittarius in 4th house. Powerful as 4th and 5th house lords, they form a Raja yoga. His greatest financial success came in Saturn dasa, from Dec 2, 1947, assisted by the JU-SA conjunction Feb. 8, 1961 at 1:53 Capricorn. 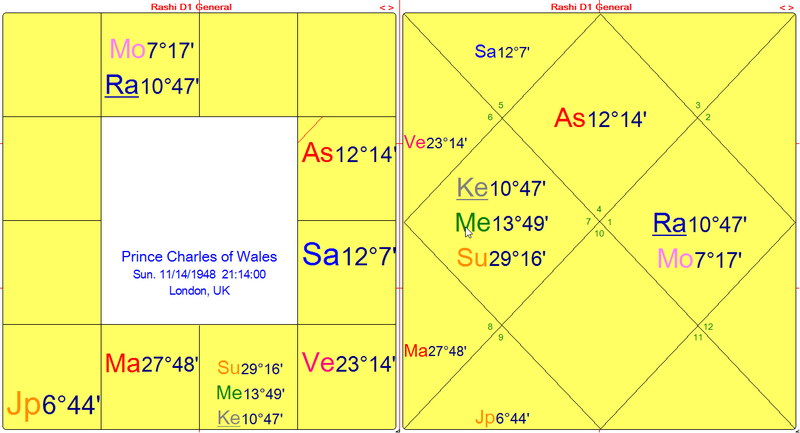 Natal JU-SA are in Graha Yuddha which Saturn wins, in Purva Ashada, owned by Venus strong in Capricorn in the 5th house. Both Venus and Saturn are planetary friends of Virgo Ascendant, whereas Jupiter is maraka. 4) Margaret Mead, anthropologist, author. (b. Dec. 16,1901, 9:00 AM EST, Chicago, IL.) Ascendant 25:18 Sagittarius, JU- SA in Sagittarius in the Ascendant. Her first book, Coming of Age in Samoa, was published in 1928, a result of her nine month stay in Polynesia in 1925 during her JU-SA dasa, and triggered by the JU-SA conjunction at 3:49 Virgo Sept. 9, 1921 in her 10th house. That same year marked the beginning of her academic career at Barnard College, after a rough start at DePauw University. She graduated from Barnard in 1923. Dharma and Karma lords closely involved with her Ascendant and Asc. lord, and four planets in Sagittarius in the Ascendant kept her traveling and devoted to studying foreign cultures. 5) Paramahansa Yogananda, yogi, founder of Self Realization Fellowship in the USA. (b. Jan. 5, 1893, 20:38 LMT (Zone –05:21), Gorakhpur, India.) Ascendant 9:15 Leo, Jupiter in Pisces opposite Saturn in Virgo, 2 – 8 house axis. Yogananda’s travels to the USA in the early 1920s were triggered by the JU-SA conjunction in his 2nd house of speech. He learned English almost instantaneously and was a major fundraiser for his organization in the West. He entered Maha Samadhi on March 7, 1952, when Jupiter and Saturn, planets of Dharma and Karma were almost exactly at their natal positions. 6) Julia Child, master chef, author, television show host (b. Aug. 15, 1912, 23:30 PST, Pasadena, CA.) Ascendant 13:16 Taurus, Jupiter in Scorpio opposite Saturn in Taurus. As 9th and 11th lords, respectively, Jupiter and Saturn form a Dhana yoga from the Ascendant, and Raja yoga from Moon in Virgo. Her first book, Mastering the Art of French Cooking was 10 years in the making (1948-58), and was finally published Sept. 1961, aided by the JU-SA conjunction Feb. 18, 1961 at 1:53 Capricorn in her 9th house of publishing and broadcasting. Her television show The French Chef, made its on-air debut Monday, Feb. 11,1963 (Boston, MA), and became the longest-running program in the history of public television. 7) Rupert Murdoch, global media mogul. (b. March 11, 1931, 23:59 AEST, Melbourne, Australia.) Ascendant 9:31 Sagittarius, Jupiter in Gemini opposite Saturn in Sagittarius. Asc. 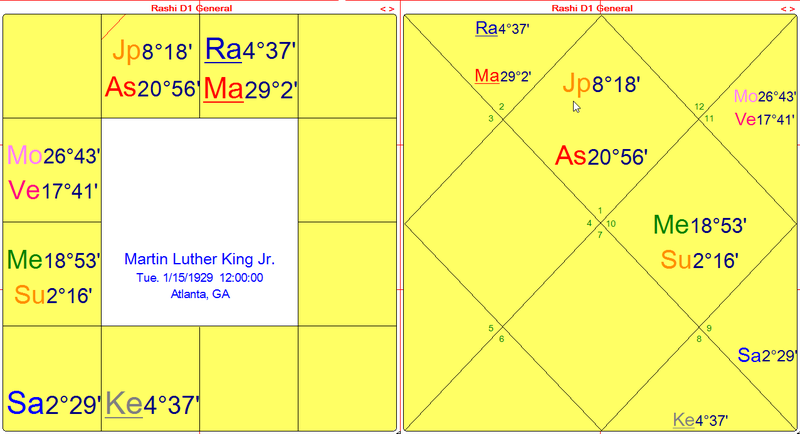 lord and Dharma planet Jupiter aspects the Ascendant and 2nd lord Saturn, creating a Dhana yoga. JU-SA conjunctions in Virgo in 1980-81 in Mercury’s sign in his 10th house of career were critical to catapulting Murdoch on to a broader media stage. In 1981 he purchased The London Times, and by 1985 he became an American citizen, a necessity since he owned so many American media properties. In Dec. 2007 he bought the Dow Jones group (Wall Street Journal, etc.) for $5.6 billion, extending his vast media empire even further. 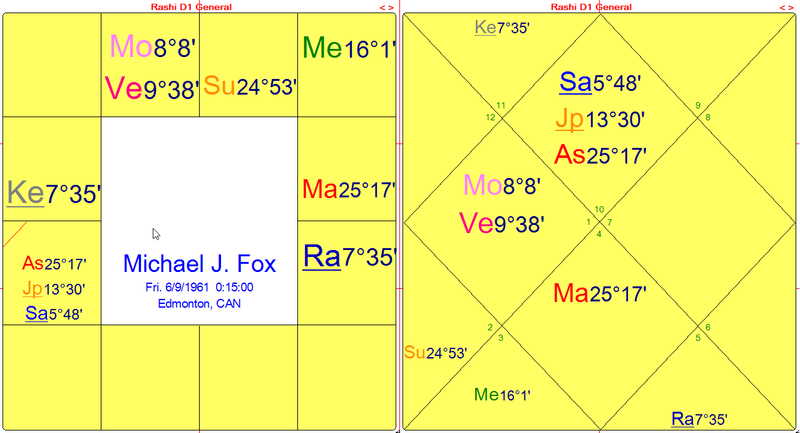 Murdoch’s natal Ascendant is close to the USA chart Ascendant at 8:59 Sagittarius (July 4, 1776, 6:30 PM LMT, Philadelphia, PA, James Kelleher chart). 8) Ammachi, Hindu saint. (b. Sept. 27, 1953, 9:10 AM IST, Vallickavu, India.) Ascendant 23:35 Libra, Jupiter in Gemini, Saturn in Libra – AIR TRINE. The emphasis is on her communications of love, spiritual upliftment and greater understanding between all peoples, regardless of race or creed. 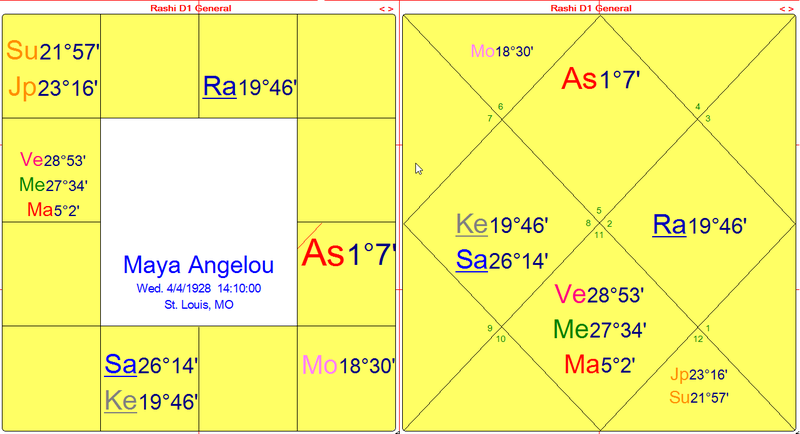 She has made world tours since 1987, and is even better known internationally since the JU-SA conjunction in May 2000 in her 7th house, and the start of her 19-year Saturn dasa, from July 18, 2006. Navamsa Saturn is Dig Bala in Scorpio. In addition to numerous humanitarian projects in India and around the world, Ammachi has originated a whole cottage industry of books, recordings (including a large collection of bhajans – Hindu sacred chants), and now Amrita TV. 10) Prince Charles of Wales, British royalty. (b. Nov. 14, 1948, 21:14 GMT, London, UK.) Ascendant 12:14 Cancer, Jupiter in Sagittarius, Saturn in Leo – FIRE TRINE. 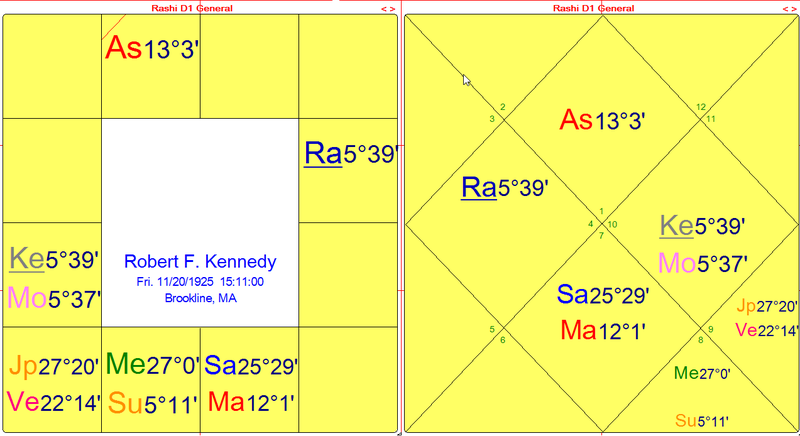 This Fire trine is less well placed from the Ascendant, with Jupiter in the 6th house and Saturn in the 2nd house, giving some awkwardness in public speech, and lending conflict to the Dharma of inherited kingship, with 9th lord in the 6th house. Jupiter & Saturn are better placed from his Moon, enabling him to find happiness from women, and a mate, after some struggle. Moon is close to Rahu. 11) Maya Angelou, African-American poet, author, historian, actress, playwright, civil rights activist, producer, director, college professor of American studies. (b. April 4, 1928, 14:10 CST, Saint Louis, MO.) Ascendant 1:07 Leo, combust Jupiter conjunct Sun in Pisces in 8th house opposite Full Moon at 18:30 Virgo; Saturn conjunct Ketu in Scorpio in 4th house – WATER TRINE. Her artistic creativity was unleashed after 5 ½ years of self-imposed muteness from age 7, when she was raped. Saturn is uneasy in Scorpio, especially in the 4th house. 12) Paul Newman, stage and film actor, entrepreneur. (b. Jan. 26, 1925, 6:30 AM EST, Cleveland, OH.) Ascendant 20:16 Sagittarius, Jupiter in Sagittarius – Dig Bala, Saturn in Libra in 11th house. Jupiter is strong in its own sign, and benefits from Saturn’s aspect, as Saturn is exalted, and in Jupiter-owned Vishakha nakshatra. 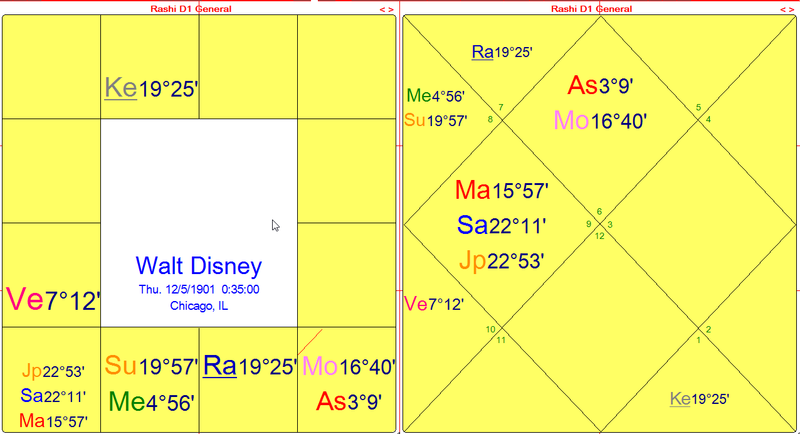 Saturn dasa from Feb. 16, 1956, favored him even more than Jupiter dasa. This excellent combination of Jupiter and Saturn eased the way for a graceful, long and acclaimed career in film and theater, supplemented by racecar driving, a very profitable food business (a charity), and a fulfilling personal life. Venus dasa from Feb. 1999 would be far less favorable, especially for physical health, as Venus is planetary enemy of Ascendant lord Jupiter, and placed strongly in the Ascendant in Sagittarius. On May 25, 2007 Newman formally retired from his acting career, and announced he would continue directing. But those plans were curtailed from fall 2007 due to his diagnosis with lung cancer, and subsequent treatments. Newman died of lung cancer on Friday Sept. 26, 2008, at age 83. He was in Venus-Rahu dasa. Tr. Jupiter at 19:04 Sagittarius was just three degrees separating from his natal Jupiter, with tr. Saturn at 20:40 Leo, in a close fire trine. He was beloved as a philanthropist, as well as actor, director and producer. Both a star and a seasoned professional, most of his work was in film, though he was also active in theatre and television. 13) Robert F. Kennedy, politician, U.S. Attorney General and Presidential candidate. (b. Nov. 20, 1925, 15:11 EST, Brookline, Mass.) Ascendant 13:03 Aries, Jupiter in Sagittarius in 9th house, exalted Saturn in Libra – Dig Bala in the 7th house conjunct Ascendant lord Mars. Both natal Jupiter and Saturn aspect the Ascendant. The position of these planets is so fine, especially for partnerships, they would have given him a longer and more successful public life, if not for the influence of natal Mars exactly on the Descendant with Saturn, bringing him many enemies. He was only 35 when he became Attorney General in his brother Jack’s administration, and one of the youngest Attorney Generals in U.S. history. Navamsa Jupiter is Vargottama in Sagittarius, but in the Navamsa 6th house of conflict. He was killed June 5, 1968, in Jupiter-Mercury dasa, in the midst of his presidential campaign. 14) Queen Elizabeth II, British royalty, coronation June 1953. (b. April 21, 1926, 2:40 AM BST (Zone –1), London, UK. ), Ascendant 28:33 Sagittarius, Saturn in Scorpio aspects debilitated Jupiter in Capricorn conjunct Mars at maximum degree of exaltation, 28 degrees Capricorn. 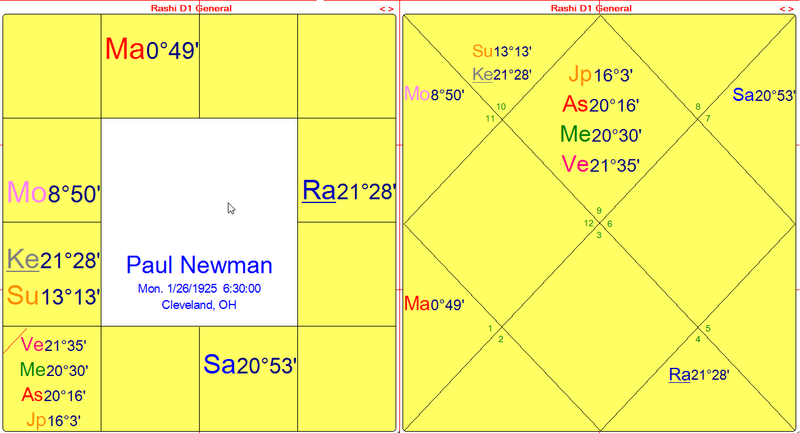 Mars owns the sign where Saturn is situated and the nakshatra where Jupiter is situated – Dhanishta (“the wealthiest”), galvanizing the entire mutual connection, and elevating Jupiter in a powerful Neecha Banga Raja yoga. Her status was unexpectedly elevated in the dasa of two Neecha planets (Jupiter-Mercury). The reverse combination – Mercury-Jupiter dasa – comes Aug. 20, 2012 thru Nov. 18, 2014, perhaps marking the end of a modern Elizabethan era. 15) Albert Einstein, German-Swiss-American theoretical physicist. (b. March 14, 1879, 11:30 AM LMT, Ulm Baden-Wurttemberg, Germany.) Ascendant 19:28 Gemini, Jupiter in Aquarius, Saturn in Pisces, in houses 9 & 10 in a Parivartana yoga. Ascendant lord Mercury in Pisces is affected by both planets, and situated in Saturn’s nakshatra, Uttara Bhadra. 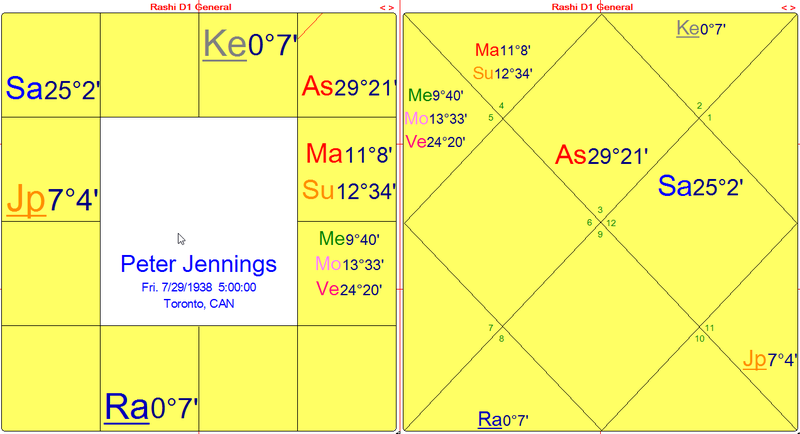 With Gemini Ascendant, the intermingling of Jupiter and Saturn as both karakas for Dharma and Karma, and natural 9th and 10th house lords – makes this an inevitably powerful combination for career, status, and recognition for one’s achievement in career. The positions of the other planets flesh out the other details of the destiny. 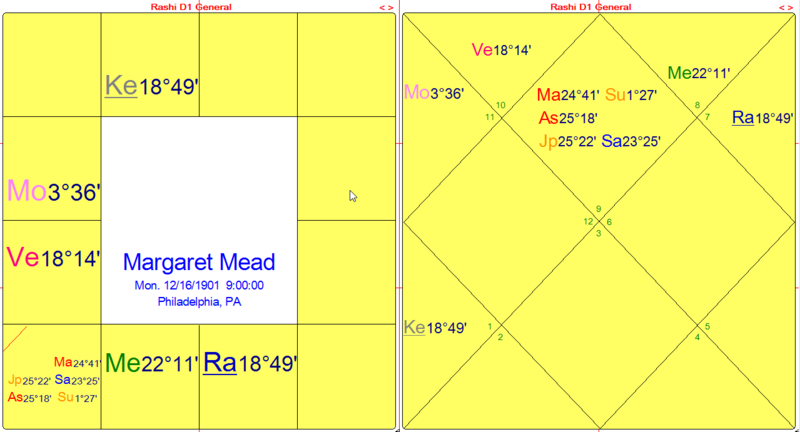 For best results, ideally the Ascendant lord (in this case Mercury) shares in the Raja yoga with Jupiter and Saturn. That occurs in this case. Einstein’s inability to speak until age 9, his major scientific innovations through dreams – these are but a few factors associated with debilitated Mercury in Pisces in contact with Jupiter and Saturn in the 10th house. 16) Peter Jennings, television journalist, ABC News anchorman 1965-68; 1983-2005. (b. July 29, 1938, 5:00 AM EDT, Toronto, Canada.) 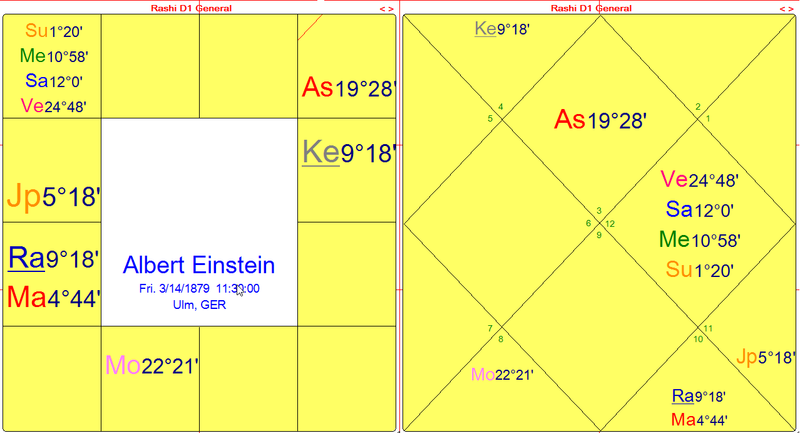 Ascendant 29:21 Gemini, same Jupiter and Saturn house positions as Albert Einstein. Ascendant lord Mercury in Leo is closely opposite Jupiter in Aquarius. Starting with his own radio show at age 9, Jennings had little doubt from early on that his life was in broadcast journalism. He left high school early and followed in the footsteps of his famous father, becoming one of the most successful television journalists of the modern era. These major yogas in the 9th and 10th houses can catapult one to career visibility, even if the Dasa periods of these planets do not occur during the lifetime, as with Albert Einstein, or – as with Jennings, only in the last six years of life. Jupiter is also Badhaka planet for Gemini Ascendant (creating obstacles). Thus its dasa may not run smoothly. Jennings died 6 years into it, at age 67. 18) Adolf Hitler, politician, German political & military leader, 1933-45. 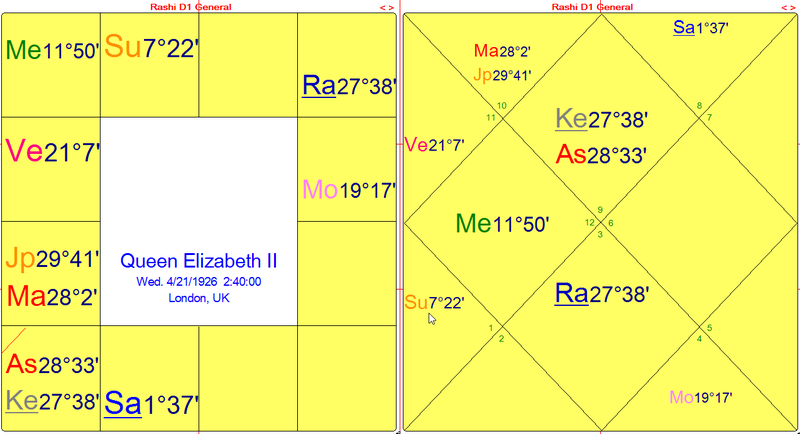 (b. April 20, 1889, 18:30 LMT, Branau am Inn, Austria), Ascendant 4:22 Libra, Jupiter in Sagittarius conjunct Ketu in Purva Ashada (nakshatra lord Venus – winner of Graha Yuddha), Saturn in Cancer in the 10th house. Jupiter aspects seven natal planets, and Saturn aspects four of them, including Ascendant lord Venus. With no real prior sense of life direction, other than some unattainable artistic ambitions, and having previously avoided the draft in his native country of Austria, he became galvanized to fight for Germany. He enlisted Aug. 3, 1914, a few days after WWI began, marking the start of his military and political career. Tr. Jupiter was in Capricorn, tr. Saturn in Gemini, echoing the natal 6-8 relationship. 19) Mahatma Gandhi, lawyer, politician, political and spiritual leader. (b. Oct. 2, 1869, 7:11:46 LMT, Porbandar, India.) Ascendant: 4:34 Libra, Jupiter in Aries, Saturn in Scorpio. 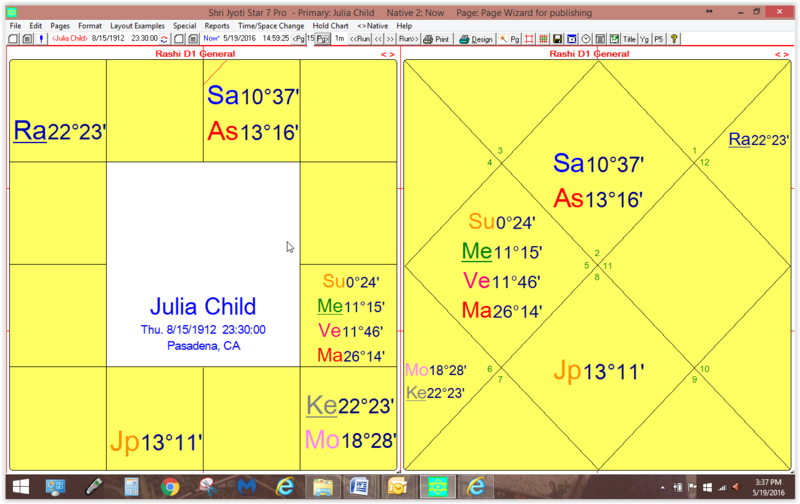 Seven planets are in chara signs in kendras. Gandhi was above all a moral force, through his leadership of the non-violent civil rights movement. His activism came first in South Africa, 1893-1914, then in India, 1915-1947, in its fight for independence from British rule. In April 1893, Gandhi’s first experience of racial discrimination in South Africa galvanized him into action, helping him to overcome a debilitating shyness when speaking in public. Tr. Jupiter was in Aries, tr. Saturn in Virgo, echoing the natal 6-8 positions. 20) Al Gore, journalist, politician, U.S. Senator, U.S. presidential candidate; Nobel-prize winning filmmaker and educator on global warming. (b. March 31, 1948, 12:53 PM EST, Washington, D.C.) Ascendant 11:05 Cancer, Jupiter in Sagittarius conjunct Asc. lord Moon in the 6th house, Saturn in Cancer conjunct Mars in the Ascendant. Gore’s early trajectory in journalism, divinity school, and law school was cut short by a 1976 run for the U.S. House of Representatives. In the realm of politics, his famous father’s ambition for him was always a factor. Al Gore served Tennessee as Congressman, 1977-1985, and Senator, 1985-1993. He then served as Bill Clinton’s Vice President, 1993-2001. As the 2000 Democratic presidential candidate, Gore won the popular vote but suffered a dramatic and controversial loss to George W. Bush. It was decided by the U.S. Supreme Court and without the full Florida vote recount. Gore conceded on Dec. 13, 2000 after weeks of legal battles. Copyright © 2007, Revised 2008 By Edith Hathaway. All rights reserved. This article appeared in the CVA (Council of Vedic Astrology) Journal, Spring/Summer 2009 edition, pp. 14-20. It expands on material initially presented by the author in her lecture at the 12th International Symposium on Vedic Astrology, sponsored by the American College of Vedic Astrology, held Sept. 5-9, 2007 in Phoenix, Arizona. Only an Enlightened or fully Self-realized being can enter Maha Samadhi, or the final conscious abandoning of the physical body at death. All karma must be completely dissolved.